A variety of recorded materials that make it possible to see and hear Konosuke Matsushita speaking are available in the Exhibition Room and the Management Library. The guidebook and all videos are available in Japanese, English, Chinese and Korean. 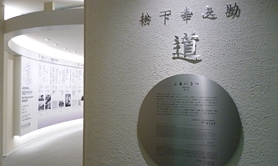 Our library spotlights keys to success in the management of Konosuke Matsushita, founder of Panasonic Corporation—one of the world' s major electric appliance manufacturers - from diverse aspects including his management philosophy, requirements for corporate managers, and ideas on human resource development. We hope this will provide you with a guide to planning your management philosophy, reviewing your management, and establishing policies for human resource development at your company. We present Konosuke Matsushita's numerous sayings on management, work, and life. These may give you ideas on how to establish your own philosophy on work, management, and life. We provide you with an opportunity to learn about the success of Japanese-style management, which is said to be the driving force behind Japan's miraculous economic recovery after World War II. 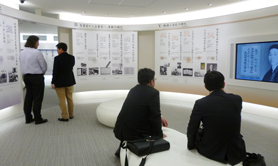 The Library holds an ample collection of company history books, books of famous corporate managers in Japan and abroad, and audio-visual materials of lectures by corporate managers. minimum 5 up to 50. For more information, please contact our receptionist.